One of our favorite parts of any motorcycle adventure is figuring out what to bring to take care of any need we might have while keeping it as minimal as possible so that everything makes it in transit. This can be a difficult task depending on how your bike is set up, but for this exercise, we are going to assume that at minimum you have a luggage rack on the back of the bike. We’ve separated these lists into 3 different categories for convenience. 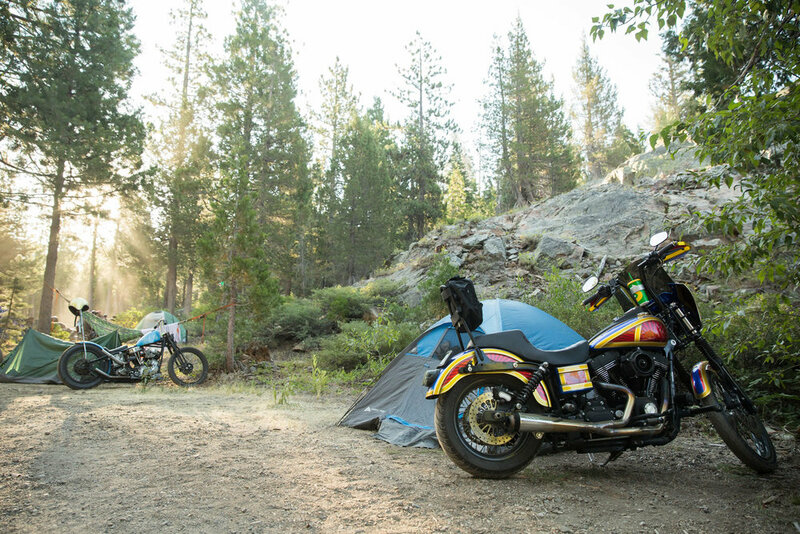 If you’ve never camped off the bike, this is a solid guide for you to secure good times. Even if you are a seasoned road warrior, we highly suggest going through this list as we are constantly learning about new gear on moto trip we take. Just the Essentials: The bare minimum to ensure you’ll be safe from 3 season elements. Rufio is a master of the bare minimum. Getting Fancy: Everything from the Just the Essentials list, but your portable home gets an upgrade. Jase's bike is set up nicely for packing gear and logging miles. Extra points for beverage holder behind the fairing. Glamper: All the items from the Just the Essentials & Getting Fancy list, and you add an addition to your home. A true glamper is resourceful and can make a rustic vessel for charcuterie out of items found at the campsite or along the road. It's not Otto's way, it's THE WAY.